With the festival on the horizon I’m starting to get my head around some of my potential fancies and stocking up the betting bank. I reckon it could be a much more open festival this year. There won’t be as many Mullins favourites going in and I think there is some potential value in the big races as well as the handicaps. Watch this space!! The best race of the day is the Grimthorpe Chase at Doncaster. THE LAST SAMURAI is using this, as last year, as a prep for the big one at Aintree. He will no doubt run a good race but he has 6lbs more weight to carry this year and races off a 12lb higher mark. WAKANDA will have to push it from the front after a change in tactics backfired last time and I think he will set it up for two of them. The first one is LOOKING WELL, he was staying on very well when defeated by ZIGA BOY here last time over a shorted trip. This longer distance could play to his strengths. However, I am opting for VIVALDI COLLONGES. He gives us a lot of value in the race and even though the rain isn’t perfect he has winning form on soft ground and worse. The jockey has a good record on him and he is racing off a good mark. The stats show that not many winners of this carry more than 10st 12lb, I don’t think that extra pound will make too much difference! He ran a stinker at Warwick last time behind a resurgent ONE FOR ARTHUR, it is noted that he did exactly the same last year and then won next time out. He also defeated the aforementioned at Kelso last year and therefore has some solid form. He will love the smaller field and I think he’ll run a big race at a big price. 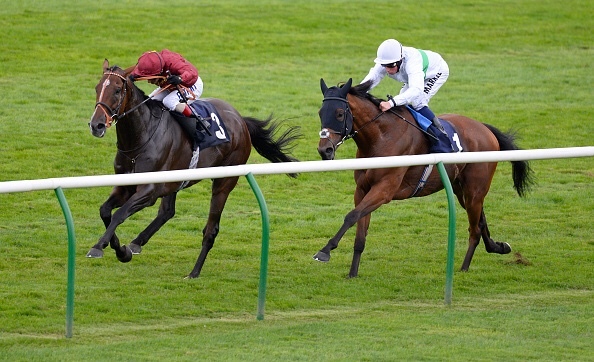 VOCALISER ran a cracker last time at Haydock off a 4lb lower mark in a similar class 4 race. He was just pipped by DEEPSAND that day and the 3rd that day (RAISE A SPARK) and the 4th (CHEIFTAIN’S CHOICE) have both won since. I think he will win well today. The Greatwood Hurdle has cut up a little due to the rain and I really fancy the chances of an old favourite, MELODIC RENDEZVOUS. He has lost his way a bit, but he is getting a bit long in the tooth. However, there was a bit of sparkle there behind YANWORTH last time and he has only ever run once before at a lowly level as this, and won. He should have too much class for these and will have the confidence to beat them off top weight! He’s good value! Finally, VIC DE TOUZAINE, is a progressive looking horse and despite the step up in class, he should run well and will love the underfoot conditions. He was beaten when running well last time by DUSTY LARK, who had the benefit of course fitness. He is the one who catches the eye in a field of question marks. Good luck whatever you’re on! A cracking week for profit on the blog last week with Dancing Shadow and Diego Du Charmil both going in. The ground is obviously key for the latter and I’ve always thought he was a decent horse and he win easily last week. I thought the softer ground would have helped Sandy Beach last week but he toiled in it! He has a good handicap in him Im sure! Not much value today but some cracking races for the festival. I expect both Altior and my Gold Cup fancy Native River to win. My biggest fancy today is VEINARD in the Betfair Hurdle. He is still a novice but has been running some good races and he just got hampered at the wrong time at Leopardstown in good race. He travels strongly and should get a decent pace with Clyne at the front. The ground will suit and he is racing of a very nice weight. He looked to move very well last time and I can see him creeping into this up the Newbury straight. 10-1 in places and he’s a cracking win bet. VIEUX LILLE is my other selection today. He has been progressing well and seeming to get better and more experienced with every run. He finished second behind a well handicapped YALA ENKI last time and he goes off the same mark today. Not great value but worth a bet at 3-1. Last week’s first blog for a while proved to be a cracker with one of the advised two, KRUZHLININ going in at 9-1. A nice £56.25 profit! I’m hoping for a continuation of that luck today. 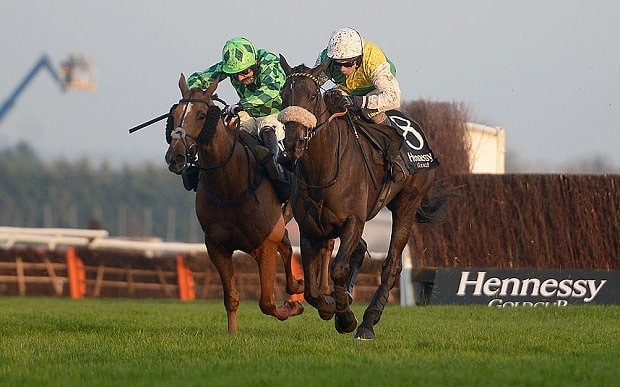 The Hennessy is one of my favourite Gold Cup races, you need quality, stamina, speed and generally to be a handy horse. NATIVE RIVER is a worthy favourite and he could certainly show the improvement needed to win this. He’s ridden handy, his stable are confident and has the champ on board (yet to win the race). Is he genuinely up to this class? I think he is and he could be the next rising star from the Tizzard yard. Previous winners of this fab race do include MANY CLOUDS, BOBS WORTH, DENMAN (twice), TRABOLGAN etc. Let’s see!! 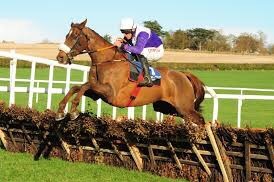 I had VICENTE in the Scottish National and he is another rising star but I think he needs further than this trip. I’ve had TRIOLO D’ALENE on my watch list for ages, if the ground gets even better he has a cracking chance. He’s on his last winning mark an carries 5lb less than when winning this a few years ago – could he repeat Denman and win it twice? He’s worth an each way bet! Readers of my blog will know my love affair with HOLYWELL, since napping him to win the Pertempts at the festival I’ve always followed him. Last time out was purely a pipe opener for this. He isnt really a horse for this time of year, however a three mile trip, on goodish ground, with a quick pace is right up his street. Blinkers are on, he carries 10lb less than his second to UN TEMPS POUR TOUT at Cheltenham and he is in effect 7lbs better off with that rival today. The pace of the race is key and if Richie gets him jumping up near the pace his speedy jumping and stamina will come in to play. He’s a monkey and it all depends on his mood. I’ve always thought he was a high class horse and should have been rated at 160+. A couple of plays in a cracking race! GASSIN GOLF is an interesting contender in the 1405 at Newbury. He has ran a couple of crackimg races in the past in better standard races than this. Narrowly beatentwice in the Imperial Cup at Sandown off OR121 and OR132. He’s running off 3lbs higher in this and on the same mark as his encouraging return at Fontwell. That was his first run for over a year and this increased distance could well suit too. The drying ground will certainly play to his strengths and I think he’s a much smarter horse than he’s shown. Big run expected. Not a great deal of success last week I'm afraid and I was gutted at how poorly LANDSCAPE ran when I was so confident of a big run! The only liitle bit of success was WOODFORD COUNTY'S third in the Eider! We win some, we lose some. As I'm sure all of you are, I'm counting the days down to the festival – bring it on! Had such a busy week this week with work and I'm looking forward to kicking back and watching this sport we all love today. Whatever your we earned dosh is on, good luck and I hope you get a shout and win some back of the old foe. The twitter gamble boys have opted for these four today – give them a follow again and I hope today is the day their four timer comes in. 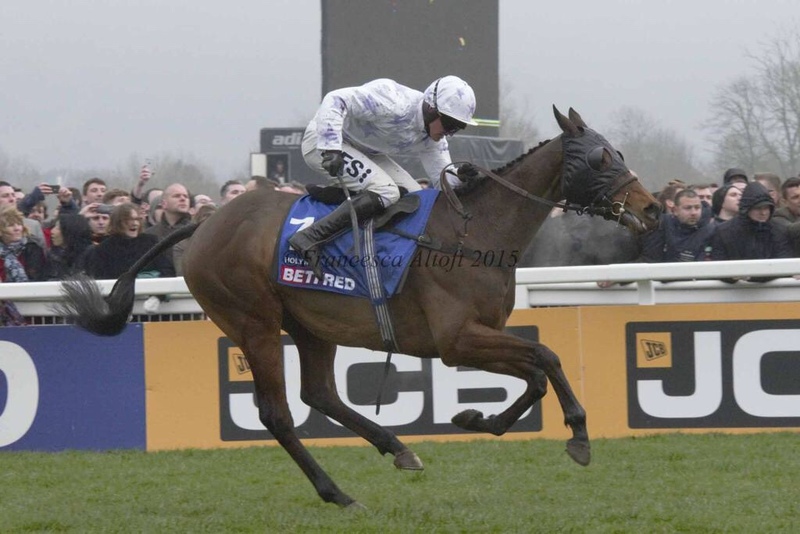 Showed his true class when winning for the blog at 25-1 on New Years Day at Cheltenham. I was really confident of him that day and I know some of you were on him too! I'm even more confident he can take this today! He has been raised 6lbs for his win, but I still think he is a better horse than he new mark and there is more to come. These types of races over longer distances that need him to be bold and brave bring out the best in him. There are other front runners who will push him too today. Sean Bowen returns and takes 5lbs off to help our cause more yet for me the biggrst factor is the ground, he loves good ground! Sit back and enjoy! Paul Nicholls has won 6 of the last 9 runnings of this and today my selection can make it 7. I backed him last night at 5-1 and as I type this he is 11-4 in places – the money is coming! He is a smart horse and has some decent form in the bag; beating DOLATULO at Sandown and running well in fifth beihnd THE YOUNG MASTER over a distance too long. He drops back in trip today and the ground will help, he has a big weight to carry but is the best horse in the race for me. He is two from two here, and if he reproduces that or his Cheltenham run back in October he will win is easily in my opinion. The concern is his last two runs which have been a little poor to be honest. He's been dropped 2lbs by the handicapper to OR140 and that is still a mark he hasn't won off. However, the opposition are the key; there Re no young upstarts here! Horses his own age or older are there to be taken! Horses for courses – he should run well today! BATAVIR is a decent horse but can he win three on the bounce after a 13lb hike form win one, I dont think so. My selection ran well when beaten by a short head by PULL THE CHORD in January and was then upped in trip at Haydock and ran well in a good race. The key for me here again is the ground. I think he will improve loads for the better ground, having won on good to firm on the flat! Good evening everyone! Yep I'm doing the blog on Friday night as tomorrow I am at my school again doing the final dress rehearsal for our performance of Our Day Out next week. I'm hoping Warwick survives the chill as I have two selections there tomorrow! It has been a tough week for the Bandit and the family this week. On Sunday I had to take our beloved cocker spaniel Freddie to the vet to be put down. It came so quick, on Saturday he had started to breath a little funny and cough as if he had something stuck in his throat. It got worse on Sunday and we found a large tumour in his mouth/throat. The vet thought it was cancerous and he was struggling to breath. Broke my heart doing it but I couldn't let him be in pain. Rest in peace little fella! The photo for the blog is courtesy of Fran @Riosrider2 again. Give her a follow! Last week was a complete shocker for my selections too, I was quietly confident of a few of them and couldn't believe how poorly they ran. To be fair the ground was shocking but I can't make excuses my horses just weren't good enough. Saturday is a cracking card at Newbury and the racing at Warwick is decent too. The festival beckons everyone! Whatever you are backing tomorrow with your well earned cash – good luck! Lets hope we take a step closer to beating the old foe! The twitter gamble boys have opted for the following tomorrow – their big gamble will land soon! Won first time out this year at Ascot more or less on the bridle and he looked very smart. He was then pitched in a little too deep amd was put in his place, but finished a creditable fourth, to FAUGHEEN. He has to carry alot of weight in the race, but he has that because of what he has shown. The form of his Ascot race has swung it for me. He beat DAWALAN that day who has since gone on and won twice and looks decent. BARADARI finished third that day and he obliged the other week. You can even go further down the field at Ascot that day day and find KILCOOLEY who rompted home at Haydock too. I like to find a decent priced horse in a competitive race and I think I have found it for tomorrow. He's probably better than this and will shown it tomorrow for my money. With Sign of Victory now a non-runner I will go for this fella to come up trumps in this race. He ran so well last time after such a long lay off last time and he may now step up today. This fella just keeps impressing me, and he seems to get better and better. He has been raised a further 6lbs for his last success to a mark of OR153. That is still a little less than some of his rivals in this and he needs to improve again to trouble HOUBLON DES OBEAUX and UNIONISTE. My guy travels so well in his races though and hasn't put a foot wrong. My question against the other two is whether the ground is soft enough for them. I'm hoping my guy jumps with the same zest and enthusiasm again and he'll give them a good run. Cracking little race. On of my old favourites! He won the Pertempts Qualifier here last year when I napped him on the blog beating GRAND VISION. He returned this season with an impressive defeat of SOUND INVESTMENT at Newton Abbott and followed that up with a second to PECKHAMECHO at Aintree. 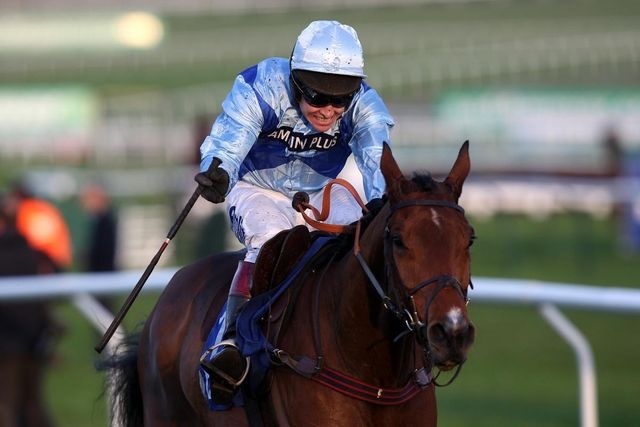 Interestingly ROLLING MAUL was well down the field that day and he went on to win well at Cheltenham on New Year's Day. He will like te ground and should make the transition to the bigger obstacles. He ran a stinker last time in November over hurdles and I find it really interesting that they have used that time to prep him for fences and not stick to hurdling. He has won 3 out of 6 here at Warwick and put in a grand show when defeating REGGIN PERRIN at Lingfield in November. Has flattered to deceive a little since but his marked has dropped back to OR118 and the jockey booking of Paul Townend really catches my eye. His mark has fluctuated between OR115 to OR120 over the past year and his mark is doable and he has carried big weight to success in the past. The twitter gamble last week didn’t fair to badly with @DazGilbert1’s selection Silviniaco Conti (100-30) and @Fernando_RFC2’s selection FLETCHER’S FLYER (11-10) winning. The guys have put up some more tips for today. See below and remember to give them a follow! I was gobsmacked by how poorly UNCLE JIMMY ran last week, there had to be something amiss he was being pushed along from over a circuit out, interestingly he still stayed on at the end. TAQUIN DE SEUIL I feel needs to go back over hurdles after that showing, doesn’t look like a chaser to me, although he’ll probably go and win a big race now I’ve said that! AL FEROF (5-2) won for the Bandit on the blog and he was very impressive, I’m hoping the same connections do it for me today in the big one! My dad won last week on the profit front and takes a 2-1 lead. On to today and another cracking day with one of my favourite races of the season – The Hennessy. 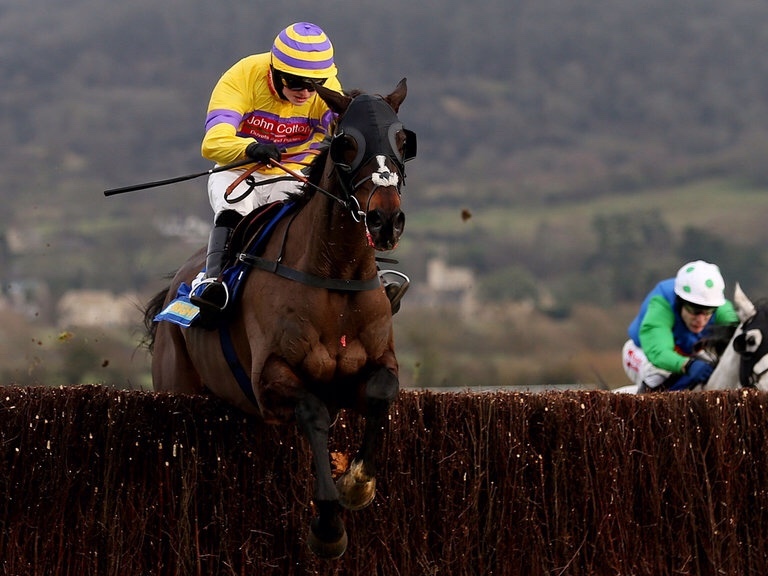 I was on good old Denman a few years ago when he defied top weight in one of the best performances I have ever seen, lets hope we get another cracking race today, and we should! On to The Bandit’s selections for today! UNIONISTE 1500 NEWBURY (NAP) – The Bandit’s tradition is always to have a nap that has a bit of value. This guy has to have that at 16-1 as I write this. Not many horse in the past few years have won this a double figure odds but I reckon my selection has a real chance. Last year his defeat of WISHFUL THINKING at Aintree was smart and he is a pound lower in the ratings today, that could prove to be a very reasonable mark judged on the second’s performances since then. This fella goes well at this time of the year and he will love the ground. Generally he’s a tidy jumper and you need to be to stay this and win. He has had a wind operation which can really sort a horse out and while he will come on for the run the Nicholls string are firing at the minute. This horse for me is way better than his current mark suggests and I’m hoping he shows that today. FINGAL BAY could be his main opponent today, he stays all day and is a class horse. The way his yard are firing too has to make me put a few shekels on him too. Should be a bloody cracker! DEFINITLY RED 1305 NEWCASTLE (NB) – this fella will go off favourite and at a short price but I have to put him in as I was so impressed how he went away from a decent bumper field last time at Cheltenham. He went straight on to my radar and this should be a stepping stone to greater things for him. One to watch for the season, I think he has the potential to be very good. LIE FORRIT 1425 NEWCASTLE (TREBLE) – getting a bit long in the tooth but has always been a classy type. 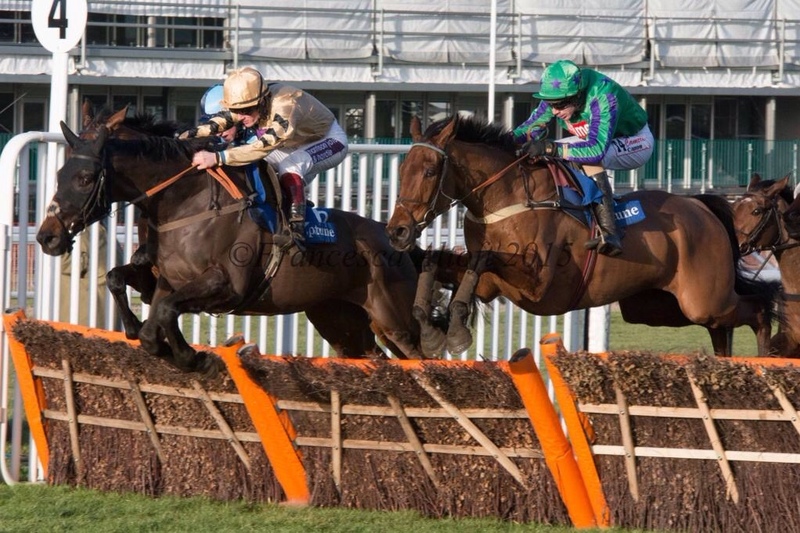 His defeat of NEPTUNE EQUESTER at Kelso in March is decent and his hurdle mark is far superior to his chase mark. He beat good old PIGEON ISLAND last time out to open his account of the sticks and has been raised 4lbs for that, not too harsh in my opinion. The ground shouldn’t be a problem and I’m hoping he shows improvement again today, this mark could be quite handy for him! ALBERT BRIDGE 1350 NEWBURY – What an interesting runner this guy is! He has ran well on soft and heavy ground on the flat and has ran off a mark in the high 80’s in that sphere. Ran well and won last time in a maiden hurdle on soft ground at Plumpton. He is chucked in here today and could be anything and I like taking a punt on these types!